Despite a handful of stellar tracks, Usher's latest album tries too hard to stay current and gets lost in the process. Usher’s fascination with guilt knows no bounds. From his earliest days as a teen idol with adult-worthy dance moves, hits like “You Make Me Wanna” (1997) and “U Remind Me” (2001) established a strict thematic formula: regret, remembrance, and of course, the sexual tension that ties it all together. It's no coincidence that Usher’s best-selling album, the 2004 opus Confessions, dealt almost exclusively with this scandalous content. Since then, the man born Usher Raymond IV has attempted to expand his musical palette, whether through EDM (“DJ Got Us Fallin’ In Love”) or flavors of the dubstep variety (“Climax”). Yet even with continued chart success, Usher has never been able to escape the shadow of his most adored work. Fans simply want the singer apologizing and seducing -- and not necessarily in that order. Ditching the artsy glitch of 2012's Looking 4 Myself, Hard II Love was pitched as a return to these soulful roots. “More urban, more R&B,” collaborator Eric Bellinger said, and that was a sentiment reinforced by promotional singles “Good Kisser” and “She Came To Give It To You.” Both tracks beamed with the swagger of a man who found his thirtysomething niche -- women and relationships were still core concerns, but they came wrapped in retro funk that felt irresistibly fun. Regrettably, these songs, along with the Juicy J assisted “I Don’t Mind”, fail to make the album’s delayed final cut. Instead, Usher’s eighth studio album tries to morph the winning content of Confessions with the trendy sounds of current R&B. It does not make for an inspired listen. Anyone doubting the Confessions influence need only hear the “Need U” intro for proof. Over a steadily building instrumental, Usher spills out a semi-rapped plea of acknowledged mistakes and hopes that “it ain’t too late to prove” he can self-correct. It's the same old Usher: a little older, maybe even wiser, but equally up to airing out his dirty laundry on record. “Crash” and “Tell Me” are spilling over with romantic honesty -- so much so, in fact, that any sense of tranquility is used up for a hushed, claustrophobic urgency. The latter track, an eight minute stunner that bumps and grinds its way to a climax, nearly buckles under its own overblown scale. Where songs like “Burn” and “My Boo” were able to strike a sonic-lyrical balance, this track and the overly sappy “Stronger” go overboard with both. Contributors Tricky Stewart, Pop & Oak, and Raphael Saadiq provide sleek R&B production, though the results, more often than not, wind up indifferent. “Make U A Believer”, a Metro Boomin’ beat with pencil sharp drum patterns, becomes a clunker topped only by its forgettable refrain. Similar fates afflict the woozy “Mind of a Man” and “Let Me”, which drowns a promising Ready for the World sample in a pool of bells-and-whistles. None of the musical choices here are awful, save for the jittery throwaway “FWM”, but few stand out beyond their initial listen. By the time “Rivals” and its bubbly K-Major beat shows up to steal the spotlight, Hard II Love’s musical hole is dug far too deep to shine. Usher’s gorgeously rich vocals can only do so much. 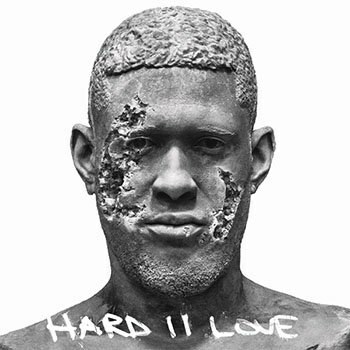 In the quest to have his cake and eat it too, Usher also mixes in a more contemporary “thug love” aesthetic. It's most evident in the album’s lead single “No Limit”, which features Young Thug and remains a delightfully catchy standout. That being said, everything about the song, from Usher’s cadence to his hip-hop references, is so Ty Dolla $ign in style that it's a wonder he didn’t get a songwriting credit. This attempt to keep up with the younger crowd also leads to a PartyNextDoor impression with “Downtime” and an acoustic Frank Ocean confessional on the title track. All are done well, though the irony in a singer emulating singers he himself influenced is not to the benefit of his album. In fact, the record's real irony lies in its title: Hard II Love. Despite a handful of stellar tracks (“No Limit”, “Missin U”), Usher tries too hard to stay current and gets lost in the process. The themes he mastered a decade ago have lessened upon return trip, while trendy beat selection keeps him from fully conveying to his throwback concept, he is, unfortunately, still an artist striving to live up to his past work. For these reasons, Hard II Love feels like a placeholder, a set of songs that sound perfectly fine while they’re on and become forgettable when they’re not. When it comes to an artist as talented as Usher, that simply isn’t -- and nor should it be -- good enough.